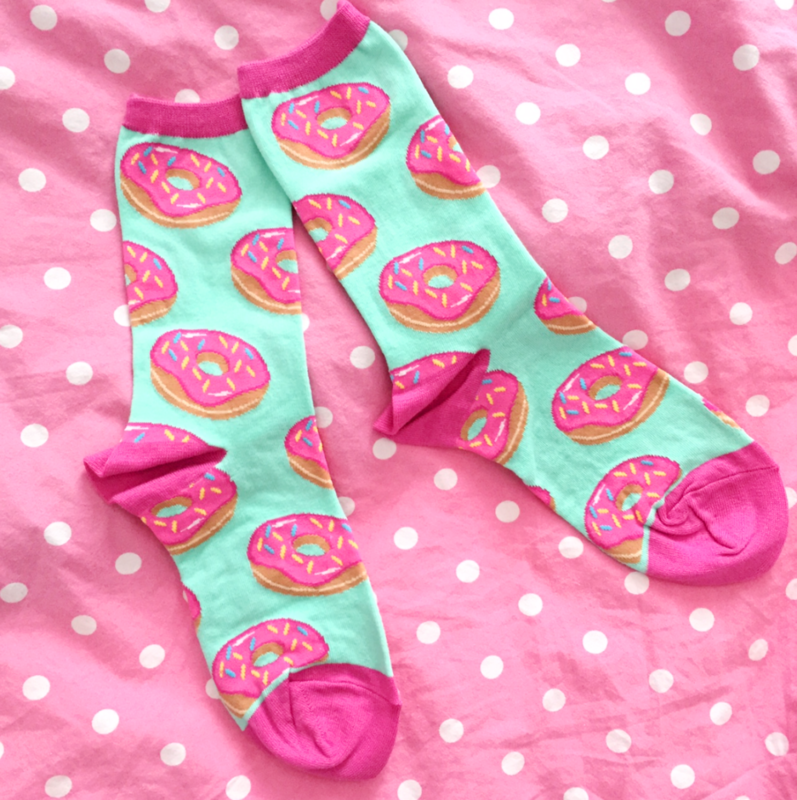 Your new favorite donut socks! 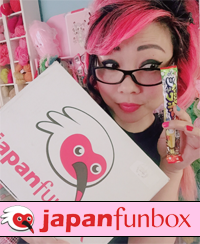 Socksmith asked if I wanted to check out some donut socks, and OF COURSE I said yes, and seriously, I love them so much! These socks come in mint or black, and I requested mint to go with all my pastel clothes. At the time, I didn’t realize that Socksmith was a company local to me, not far in Santa Cruz. This also meant that my socks arrived super quickly! Instead of putting together an outfit with the socks (which I’ll probably do later anyway), I decided to try wearing them with different shoes. I immediately thought or clear jelly sandals to show off fun socks! But I also thought they would look sweet with a little white t-strap. If you know me at all, you know I’m usually in some sort of black stompy boot. Even with a darker outfit, these socks are still a fun wink of color. And these silver boots? Okay, I NEVER wear them, except for maybe an 80s costume night. Frankly, they are really uncomfortable, even though they are super amazing. But I like to whip them out at random fun times. Like donut sock times! And lastly, I just treated myself to these amazing pink poodle shoes. 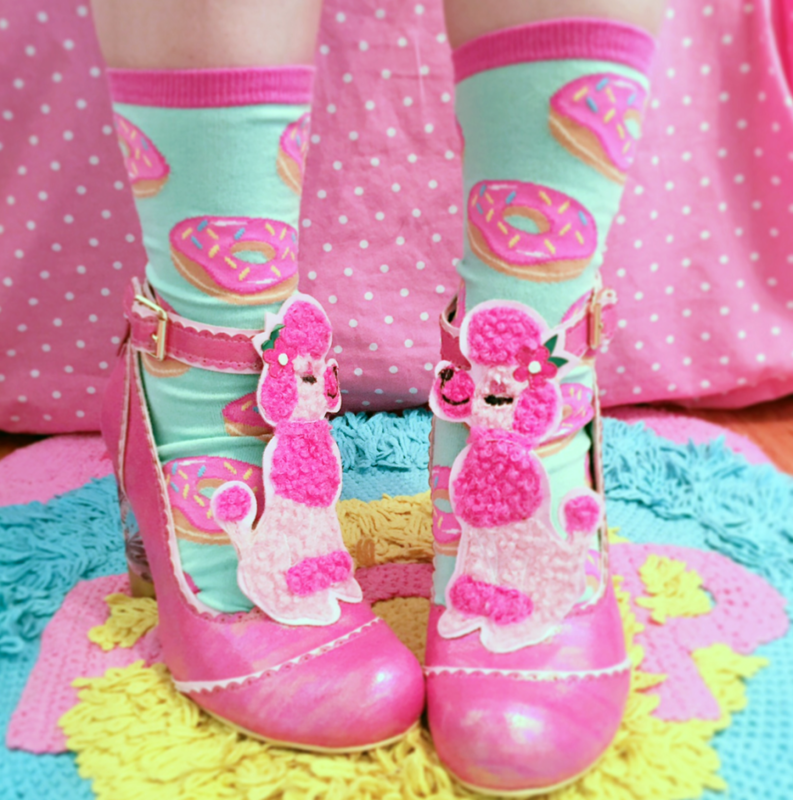 I think the donut socks and the poodle shoes were made for each other. As you can see in this last photo, the socks are a teeeeensy bit big on me (I’m a US 7 1/2), but I think that popping them in the wash will fix that right up. After poking around the Socksmith site a little, I realized I already have the macaroni and cheese socks. I also have my eye on the fawns, the soft serve, the watermelons, the gingerbread house, the roses, and the teddy bears. There’s both a women’s section and a men’s section, knee highs, over the knees, shorties, and more. 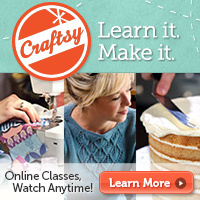 You can shop online or find a store that sells them near you! Donut socks c/o Socksmith, Sparkle Jelly Shoes: eBay, White T-Straps: ModCloth from a few years ago, Black Boots: UNIF, Silver Booties: Irregular Choice from years ago, Pink Poodle Shoes: Irregular Choice.